The Norton Early Adopter Program (EAP) is your opportunity to get a sneak peek at the latest Norton Security features and provide feedback to help shape the future of Norton Security. While similar to public betas that we’ve run in the past, it’s much easier for users to try out. No need to create a separate beta Norton account or uninstall your current product. Simply click Join and we'll do the work for you. Sign up today! ​There will be more bugs than in the standard release channel, but we’ll always stand behind the level of​ protection that we provide. You can still get help from Support, and our Virus Protection Promise is still valid. However, Support may not be fully trained on the newest features and may need to direct you to our EAP forums for more details. ​Also, if you switch back from EAP to the standard release channel, you’ll be prompted to reinstall the product and you will lose your local settings. However, cloud data such as Identity Safe logins and backed-up files will be retained. 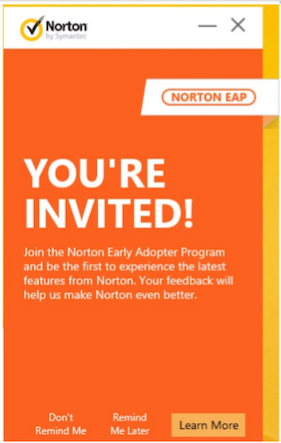 Please give us your feedback on Norton Early Adopter (EAP). Post your issues, suggestions, questions, or anything related to the program on the Norton EAP forum. We want this product to be of best quality when we release it. A New EAP Build 22.8.1024.70 (EAP-2) is now Available!